Down below you will find a short introduction on the good and the not so good of each team, along with a 2017 predicted record. The Good: Boston’s pitching staff has silently become one of the best in the league. At least on paper. David Price, Rick Porcello, plus the addition of Chris Sale should *cough* should make for a dominant season. The Bad: With the loss of David Ortiz, possibly the Red Sox’s best hitter in franchise history, will the Red Sox be able to find a replacement that can adequately fill that void? Injuries to Dustin Pedroia and other key players could stall the offense. The Good: There’s no debate. With Chris Davis, Adam Jones, Manny Machado, and 2016 home run leader Mark Trumbo, these guys can hit the ball hard and far. The Bad: Pitching. While their bullpen is anchored by Zach Britton and company, questions remain about the starters. Ubaldo Jiminez is a shell of his former dominant self, and with the rotation going a combined 38-44, the Orioles pitching will be the reason they lose the east, even with the additions of Zach Bundy and Kevin Gausman. The Good: Marashiro Tanaka is an ace in the starting rotation. With the return of Aroldis Chapman, the bullpen is strong again. And good bats in Greg Bird, Gary Sanchez, and Aaron Judge will help lead the offense. The Bad: Outside of Tanaka, the Yankees rotation struggles. The bullpen of Chapman and Dellin Betances will aid in later innings, but the starters will need to up their game. The Good: The pitching prowess of Fransisco Liriano, Aaron Sanchez, Marcus Stroman and Marco Estrada will shut down offenses. Troy Tulowitzki, Josh Donalson, and Russel Martin will continue their dominance over opposing pitchers. The Bad: The Jays lost Edwin Encarnacion, a powerhouse first baseman who hit 42 homers for them last season. In addition, injuries plague Tulowitzki and Donaldson, two more power hitters. The Good: Like the Blue Jays, the Rays have great pitching potential. Chris Archer, Alex Cobb, and Jake Odorizzi are all solid and Blake Snell has a bright future ahead. The Bad: The Rays need to score more runs. With the exception of Evan Longoria, the lineup struggled to plate runs. Kevin Kermaier, Colby Rasmus, Corey Dickerson, Matt Duffy will need to step up and find their swing if the Rays want a shot at the East. The Good: Corey Kluber and Carlos Carrasco were two of the most dominant pitchers in 2016. With Andrew Miller to close out games, pitching is no problem. The addition of Edwin Encarnacion and the return of Michael Brantley will vastly improve the offense. The Bad: Injuries always seem to happen at the worst of times for the Tribe. Brantley is healthy, but for how long? Bauer cut his finger in the World Series, and Jason Kipnis is returning from the disabled list. The team needs to stay healthy if they want a return trip to the playoffs. The Good: The offensive lineup of Miguel Cabrera, Victor Martinez, Ian Kinsler, and Nick Castellanos will return and again wreak havoc on opposing pitching. The Bad: The Tigers give up too many runs on too many defensive mistakes. Not to mention the up and down pitching of Justin Verlander and company. The Good: With great hitting from Jose Abreau, Todd Frazier, Melky Cabrera, and Tim Anderson, the White Sox look poised to have a solid offensive year. The Bad: The White Sox lose their best pitcher in Chris Sale and arguably their best hitter, Adam Eaton. Replacements and others in the lineup won’t be enough to fill the void. The Bad: Royals wish it could go back to being 2015, when they won the World Series. With the loss of Kendrys Morales, the offense will struggle again this season. With the tragic loss of Yordana Ventura (R.I.P. ), the pitching staff leaves something to be desired. The Good: Max Kepler is a powerhouse for the Twins and will help lead the offense to great outputs. Bryon Buxton is looking to excel after his breakout season last year. The Bad: The pitching staff is not good. Ervin Santana is the guy at number one, but he and Kyle Gibson just don’t cut it on talent. The Good: Pickups of Mike Napoli and Jonathon Lucroy, along with the young talents of Rougned Odor and Jurickson Profar, means the Rangers offense will lead most of the league. The Bad: After Yu Darvish and Cole Hamels, the Rangers rotation really drops in talent. With a so-so bullpen, the pitching staff is the weak link. The Good: Khris Davis has tremendous power. Combined with Rajai Davis, Trevor Plouffe, and Matt Joyce, the A’s should have a solid offensive year. The Bad: Sonny Gray is injured. Without their star ace, the Athletics pitching remains lackluster in a stellar division. The Good: Jose Altuve is one of the best two-way players in the league. George Springer and Carlos Correa add good power while their bullpen will help close out games. The Bad: The starting rotation leaves questions in the minds of fans. Dallas Keuchel and Collin McHough had less than ideal seasons last year and will be hoping to improve. The Good: Mike Trout may be the best player in baseball right now. His power is unmatched and his defensive playmaking ability is uncanny. The Bad: Like many other teams, pitching is the problem. The Angels don’t have an ace and the bullpen isn’t strong. Their best hope is that Kole Calhoun can elevate his play to have a great season. The Good: Hitting the ball is no problem for this team. The combo of Robinson Cano, Kyle Seager, and Nelson Cruz will lead the offense. The Bad: Felix Hernadez had a rough 2016. Will he be able to bounce back? The starting rotation needs to be more consistent and reliable if the Mariners want to win the West. The Good: Bryce Harper is good. He is young and talented. Max Scherzer and Stephen Strasburg headline a strong pitching staff. The Bad: Injuries and relationships will be the two biggest factors to the Nationals success or downfall. Without Harper, there is not really a power hitter and the Nationals have been known to quarrel in the clubhouse. The Good: Giancarlo Stanton continues to pound baseballs over the fence. Along with Dee Gordon, Marcell Ozuna, and Christian Yelich, this offense will score many runs. The Bad: With the tragic loss of Jose Fernadez (R.I.P. ), the Marlins don’t have an ace. The rotation is mediocre and the bullpen is just okay, lead by Brad Zeigler and Junichi Tazawa. The Good: The Mets have good power in Jay Bruce, Yoenis Cespedes, and Travis d’Arnaud. Along with a great pitching staff of Noah Syndergaard, Jacob DeGrom, and Matt Harvey, the Mets look poised to make a playoff run. The Bad: With good hitting and pitching, the thing that plagues the Mets is defense. Also, this is an aging squad and with that also comes injuries. The Good: The Braves added quite a few players to their roster. The additions of Matt Kemp and Brandon Phillips will improve their offense. The pitching staff gets the additions of seasoned pros, Bartolo Colon and R.A. Dickey. The Bad: The rotation is young and inexperienced outside of Colon and Dickey. The pitching staff must work on lowering their ERA if they wish to compete for a playoff spot. The Good: Breakout seasons from Aaron Nola and Vince Velasquez, along with the veteran Clay Bucholtz makes the Phillies pitching rotation a force to be reckoned with. The Bad: The offensive lineup leaves something to be desired. Howie Kendrick and Michael Saunders are veterans that can groom some of the rookies, but the talent just isn’t in the Phillies’ bats. The Good: The World Series champs see much of the roster stay the same. Good output in Anthony Rizzo and Kyle Schwarber leads the offensive front and the pitching rotation has depth and talent. The Bad: The loss of closer, Aroldis Chapman hurts the Cubs. While the pitching staff may be stacked, Jon Lester and John Lackey are in the finals seasons of their careers. Injuries could become a factor. The Good: The Cardinals have an ace in Carlos Martinez and other great arms in Adam Wainwright and Michael Wacha pave the way for a good pitching staff. The addition of Dexter Fowler in center field will also add a good bat in the lineup. The Bad: The Cardinals lost ace Alex Reyes, a key part of their solid rotation. Without him, the rest of the staff will need to step up and improve their best in order for the Cardinals to compete. The Good: The Pirates should have a strong pitching rotation in Gerrit Cole, Jameson Taillon, and Ivan Nova this season. Andrew McCutchen is looking to bounce back and return to his former MVP style of play. The Bad: Injuries and poor play crippled the Pirates hopes of contending last season and still could be a factor this season. Without good output from McCutchen and the starters mentioned above staying healthy, the Pirates will find themselves in trouble. The Good: Joey Votto, Billy Hamilton, and Jose Peraza will look to build on the strong finishes that they had last season. They have a lot of young talent, however, most of it is untested rookies on the pitching staff. The Bad: The pitching staff needs to improve. They posted a 5.09 ERA last season and were plagued by injuries. Without vast improvements, the Reds will not be seeing any chances of competing. The Good: Ryan Braun continues to hit well. The Brewers found two great pitching stars in Junior Guerra and Zach Davies and two emerging offensive talents in Jonathon Villar and Keon Broxton. The Bad: The pitching staff lacks an ace and is overall subpar throughout the rotation. Every pitcher was below the league average in wins and struggled with command and ERA. The Good: Clayton Kershaw’s reliable stellar pitching and the offensive lineup of Joc Pederson, Adrian Gonzalez, and emerging talent Corey Seager will power the Dodgers to the playoffs. The Bad: After Kershaw, the Dodgers lack depth in talent. Rich Hill is aging, Kenta Maeda struggled to close out 2016, and besides closer, Kenley Jansen, the Dodgers bullpen staff is less than ideal. The Good: The Giants have a great starting rotation including Madison Bumgarner, Johnny Cueto, Jeff Samardzija, and Matt Moore. Also, the addition of Mark Melancon will really help out the bullpen. The Bad: The bullpen struggled last season and was the downfall of the Giants. They blew 30 saves and struggled mightily with keeping the ball in the ballpark. The Good: After leading the NL in runs last season, Ian Desmond, rookie sensation, Trevor Story, Nolan Arenado, and DJ LeMahieu look to continue the hot hitting for the Rockies. The Bad: Injuries could plague the pitching staff and possibly the lineup. Desmond and two pitchers are already injured and if the Rockies wish to return to being a dark horse contender, they need to stay healthy. The Good: Additions of Jeff Mathis and Chris Iannetta will vastly improve the Diamondbacks pitching core and Paul Goldschmidt looks poised to lead the offense. The Bad: After Zach Greinke, the pitching staff doesn’t look like it will be able to support the team. After giving up the most runs last season, the Diamondbacks will need to figure out how to better their pitching staff. The Good: Wil Myers is an all-star candidate hitter. Along with additions of Manuel Margot, Austin Hedges, and sluggers Hunter Renfroe and Ryan Schimpf, the Padres offense is looking poised to be in for a great 2017. The Bad: Like many other teams, the pitching staff seems to be the downfall of the Padres. Last season’s 4.43 ERA can’t cut it in the league. Without an ace or any strong talent in the bullpen, the pitching staff loses the Padres any chance at contending. Like many campuses across the country Ohio University has many clubs and organizations that can impact many students lives and help them enjoy themselves in college. One organization in particular has stood out at Ohio University for a long time now that has really impacted student life in a way many may not believe possible; Thorough faith. The Athletes in Action program has had many big time, student athletes faces come through the program. A school very well known for being the top party school in America, on the other hand has some very faithful devoted athletes. In the video you will get the chance to listen to some of the head figures of Athletes in Action talk about some famous names that have gone through the programs and some to just search for their faith in sports and what types of opportunities Athletes in Action can give to all of the students at Ohio University. Working as a college student and newspaper editor can be tricky. It can be even worse when there’s no recognition. Meet Andrew Gillis, the Assistant Sports Editor of The Post, who’s life is devoted to class, improving his writing and the work of others. And we’re back, with just 56 days until opening day, you’re Cleveland Indians are busy with spring training and getting ready to make their run back to the World Series. This year we hope the result is more in our favor. Rajai Davis was not given a contract so we, as Indians fans will have to thank him and always remember his 8th inning heroics in Game 7 of last year’s World Series. Thank you Rajai, we’ll miss you. In other news, Grady Sizemore will become a special assistant to the team and the farm teams. Grady was a fan favorite in his time as an Indians and will be welcomed back with cheers. Grady Sizemore has joined us as a player development advisor! Music hit the ears of many baseball fans this past week as pitchers and catchers reported for teams. Basically, winter is over and the greatest sport in history is back. With some of the best pitchers in the league in Corey Kluber, Carlos Carrasco, and Andrew Miller, this season is already looking good. The 3-1 jokes are old and dead. Now it’s a new season and the Tribe is ready to go. Once again, the Indians are favorites to go to and win the World Series. This team is the best group of players we’ve seen since the 90’s greats of Thome, Lofton, and Vizquel. With how loose and fun the guys and the club keep their demeanor, the team is in good shape. Here are some photos featured on the Indians snapchat for your amusement. Michael Brantley may finally play in an Indians uniform again. It’s been too long since we last saw him shagging fly balls out on the grass in Progressive Field. This year, though it looks like he will finally be able to play and make a great contribution to the team. How do we feel about that? Well, we’re all smiles. 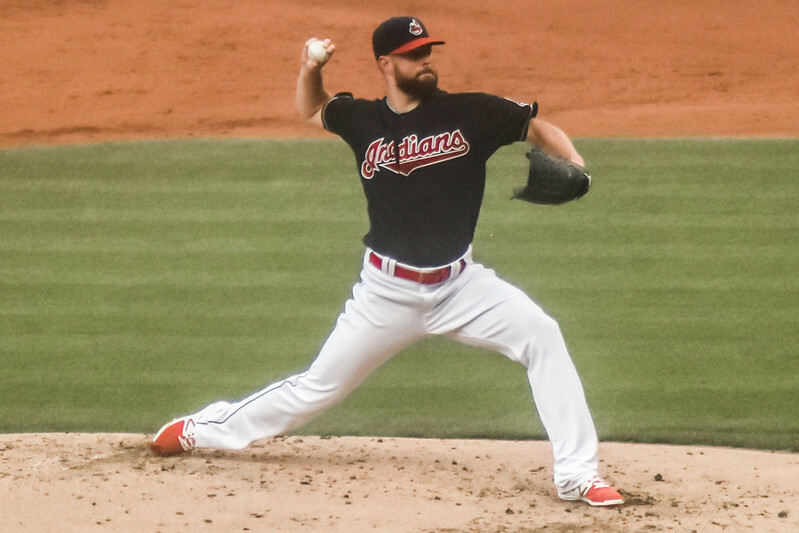 The Tribe Times is a weekly newsletter updating you on everything involving the Cleveland Indians. Bringing you the latest news, roster moves, scores, and trade rumors.